A few passing clouds, otherwise generally clear. Low 63F. Winds NE at 5 to 10 mph..
A few passing clouds, otherwise generally clear. Low 63F. Winds NE at 5 to 10 mph. 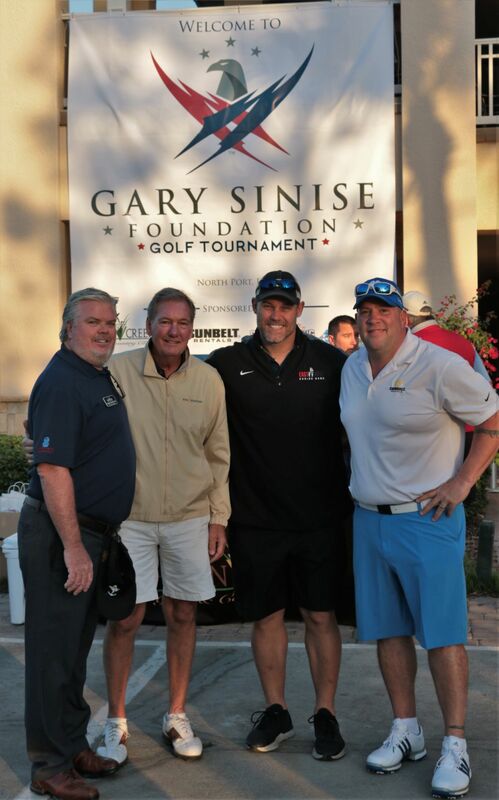 Chris Trottier (Heron Creek Golf and Country Club), Scott Bill (Brian Bill Foundation), Mike Alstott (Tampa Bay Buncanners) and Sean Perseo (Sunbelt Rentals) at the first Gary Sinise Foundation charity golf tournament in 2018. 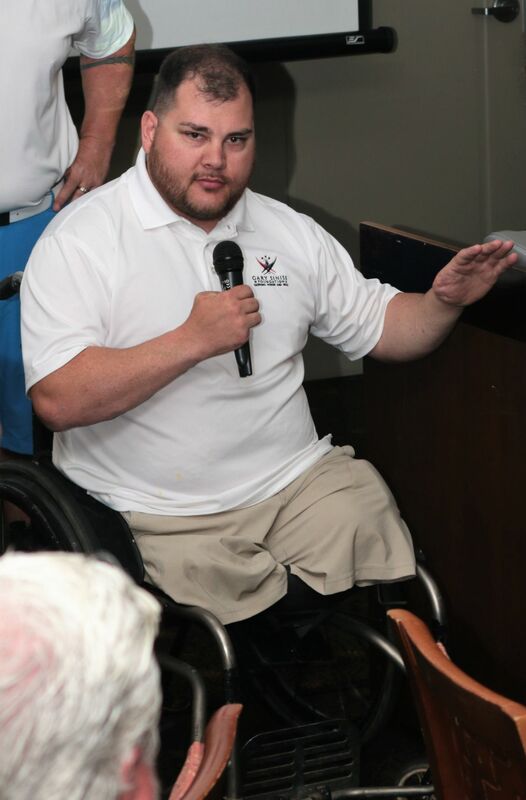 SUN FILE PHOTO BY MONICA AMAYA Sean Adams was the key speaker for the Gary Sinise Foundation golf tournament at Heron Creek Golf and Country Club in 2018. Adams was a Marine in Afghanistan when he lost both his legs. He is also a recipient of a smart house from the foundation. SUN FILE PHOTO BY MONICA AMAYA The North Port High School ROTC presents the colors in April 2018 at the Heron Creek golf tournament to raise money for the Gary Sinise Foundation. NORTH PORT — The second annual Gary Sinise Foundation golf tournament has been set for Friday, April 26, at Heron Creek Golf and Country Club. “We need more golfers and more hole sponsors,” said Laura Kozma, administrative assistant at Heron Creek in North Port. “This tournament is growing and we want to raise $100,000 this year. We are halfway there,” she said. The event began in 2018 and benefits the Gary Sinise Foundation, which assists veterans, first defenders, their families and those in need. Sinise, an actor who is best known for his Oscar-winning performance of Lieutenant Dan (Taylor) in 1994 Oscar-winning movie, “Forrest Gump,” was not on hand for last year’s tournament — nor is not expected this year. Alstott was a Pro Bowl player six times for the Bucs and helped Tampa Bay win Super Bowl XXXVII in 2002. He played for the team between 1996-2006. “Fast N’ Loud” focuses on a crew out of Dallas, Texas, that seeks “derelict classic cars across the country to buy and restore” in their facility, Gas Monkey Garage. To date, the Gary Sinise Foundation has raised about $30 million a year for veteran causes, with more than 90 percent of the money going toward specific programs like building “smart homes” for disabled veterans and paying for scholarships for children of those killed or wounded in action. Kozma said the tournament entry fee is $500 for a foursome. It is a team scramble, with an awards dinner following play. Hole sponsorships are $100. Those interested in participating should contact Kozma at 941-240-5100.